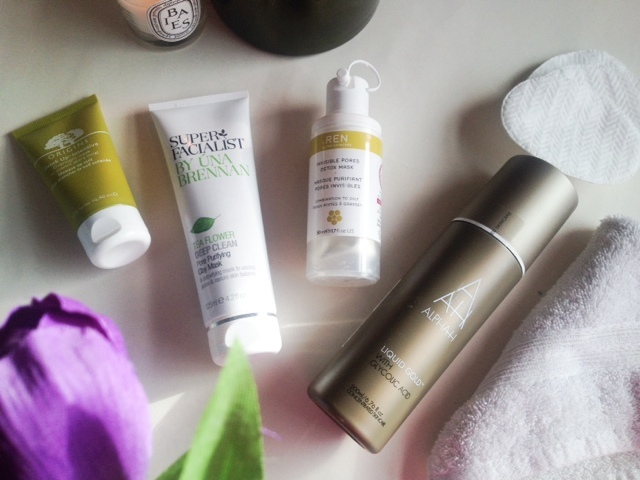 In conjunction with my morning and evening skincare routine I like to use extra products throughout the week to give my skin an extra boost, and prevent break outs from occurring. I'll firstly talk about the masks I have been using. 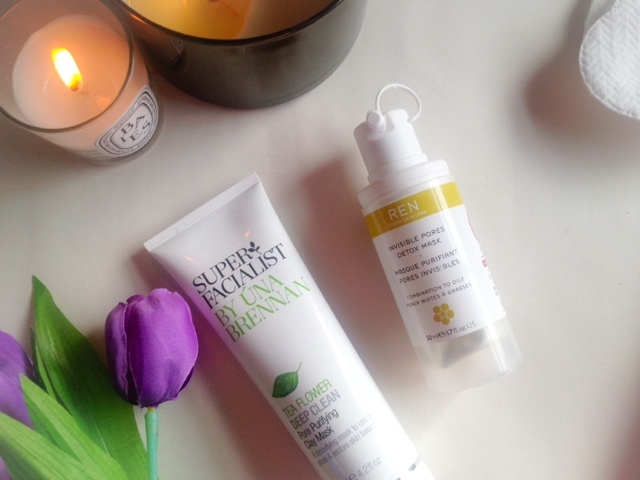 There are two clay masks in my routine, Una Brennan Tea Flower Deep Purifying Mask ( gosh, please think of another name, that one is far to long!) and Ren Invisible Pore Detox Mask. I use them weekly (alternating each week) to clean out my pores and prevent any breakouts for occurring. Both masks are very similar in what they do. They are both typical clay masks, that leave you face feeling super tight when on and are removed with a flannel after 10mins or so. 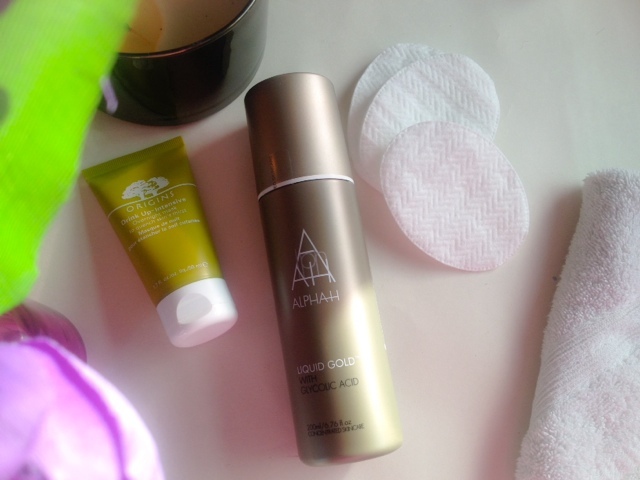 When using these my skin is left feeling lovely and soft, it feels less congested instantly and super clean. These are especially great when you're nearing that time of the month when your skin just doesn't feel itself and produces excess oils, these will help to restore your skin back to its normal balance and hopefully prevent any visits from those pesky spots. There are two other treatment that I like to use, one, Alpha H Liquid Gold will need no introduction onto my blog. As most of you may know I love this stuff! I use this every 3 days. Its a Glycolic based solution that removes all the dead skin cells from your face. It's so easy to use, you use this and this alone overnight and awaken to fresh glowing skin in the morning. I use this not only because of how it makes my skin feel and look in the morning but as an aide to helping my other skincare products work more efficiently. By removing all the dead skin you will see better results from your moisturisers and serums as there is no barrier of dead skin preventing them from working a to their full potential. Another mask I use, but not that often is the Origins Drink Up Intensive Overnight Mask. This is a love/hate sort of product for me. When I first tried it I was a little disappointed by the results, thinking my skin was going to look a million times better from all the rave reviewed I had read. I tend to use this if my skin is feeling and looking dehydrated, which to be honest is not that often and only when I've had, lets say one too many glasses of wine the night before!.... Yes I put this on when I have a hangover, you know, we've all been there, when your skin is resembling a living corpse and only a good unhealthy fry up will sort out your in sides! I don't see masses of improvement but it's lovely to wear and smells fresh and up lifting. My skin feels more moisturised and a little plumper, making the effects of the night before a little more manageable. What treatments and masks do you use as part of your skin care routine? Leave me a comment below with any recommendations. Your pics are fab lady :-) I love all of these except Una Brennan which i havn't tried but i'd love to get my hands on! I'm also lusting after the hydraluron sheets masks at the mo, will def be picking them up next time im in Boots. I've sen that Origins mask in so many posts lately! I think it's about time that I tried it for myself. Love your pictures too, they look great!